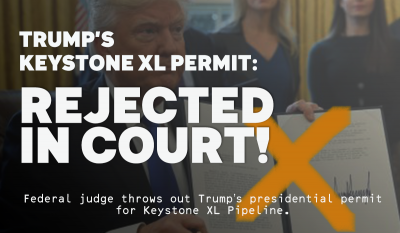 Last night, a federal judge invalidated Trump’s “presidential permit” for Keystone XL, ruling that the Administration violated key laws when it approved the pipeline. This momentous ruling is a major delay that sends the Trump administration and TransCanada back to the drawing board on Keystone XL. While Trump suggested plans to appeal, we are ready to resist every step of the way. TransCanada is on the ropes. If thousands of us pledge to resist Keystone XL, it could be enough to convince them that this project isn’t worth pursuing. Sign the Promise to Protect now. This decision confirms what we’ve known all along — that Trump’s executive order and environmental review process were a sham. Big Oil may have the money to push policy and politicians in favor of their profits, but we have morality, science, and the law on our side. This case was filed by seven groups including Indigenous Environmental Network and the Northern Plains Resource Council. The judge stated that the Trump Administration “simply discarded” the effect the project would have on climate change. This means that no work can go forward until the government more fully reviews the pipeline’s environmental impact. From the plains of Montana, Nebraska, and South Dakota to Capitol Hill, we won’t stop until Keystone XL is gone forever. For over a decade, Indigenous peoples, farmers and ranchers, and their allies around the world have been fighting to stop this pipeline. Despite every obstacle thrown our way, the movement to keep fossil fuels in the ground has kept Keystone XL from being built. And we’re just getting started. There are over 17,000 people who have already committed to take peaceful direct action to stop this pipeline and any project that threatens our climate and communities. Let’s double that number. Read the full statement from the Promise to Protect coalition here.